(2003) Traditional Arts Development grant from the Alliance for California Traditional Arts. (2001) Traditional Folk Arts grant for 'Women in E'motion' funded by the California Arts Council. (2001) Master-apprenticeship grant for 'Margam' from the Alliance for California Traditional Arts received by master Ramya Harishankar and apprentice Trisha Banerjee. (1994-1997) two time awardee of the Choreographer's Fellowship from the National Endowment for the Arts. 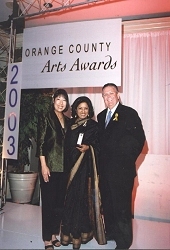 (2002) 'Outstanding Artiste of the year' award from Arts OC, the Orange County agency for the arts. (2002) designated Disney Artist in the 'From the Center' roster of the Orange County Performing Arts Center to tour schools in S. California. (1996) 'Excellence Award' for her contribution to the community from the United India Association of Southern California. (1978) First prize in bhajan (singing) competition held by Music Academy, Chennai. 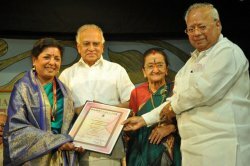 (1978) 'Singar Mani' awarded by the Sur Singar Samsad, Mumbai. (1978) 'Outstanding young artiste' by the Tamizh Isai Sangam, Chennai.